We got back to Camomile on the 21st March after our little mini break. 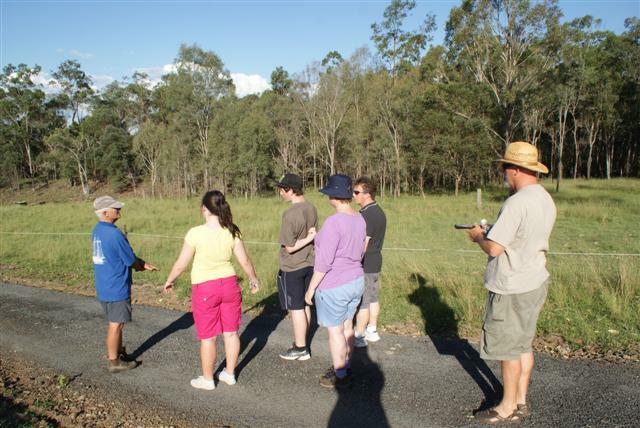 Several people had advised us it wasn’t a good idea to go north until the end of March because of the threat of cyclones. Having been lashed by the tail of one we had no intention of encountering another so we decided to hang around Brissie for a while. 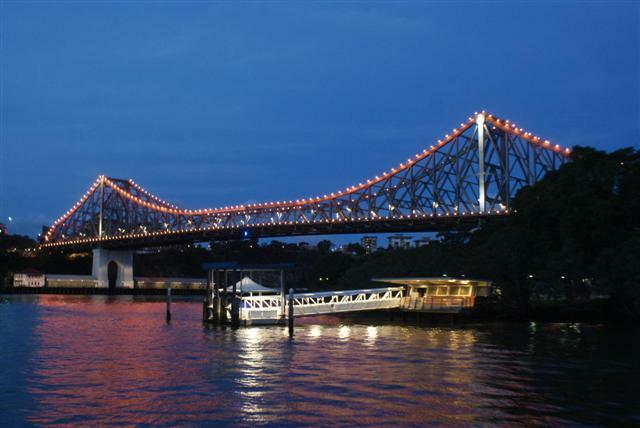 We like Brisbane; Sydney was charming but very expensive and vast whereas Brisbane is an affable place. 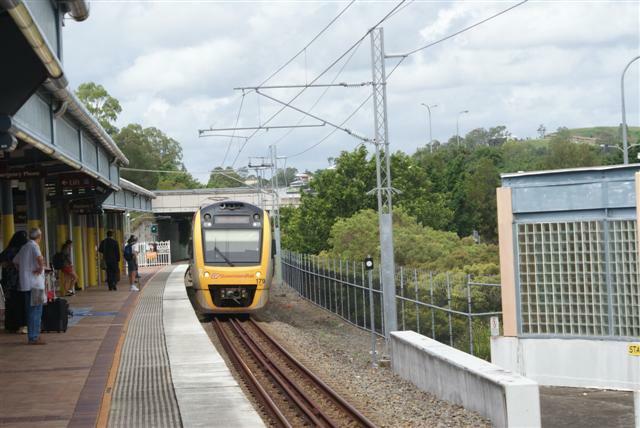 As the capital of the state of Queensland it has such a get-up-and-go feel about it. 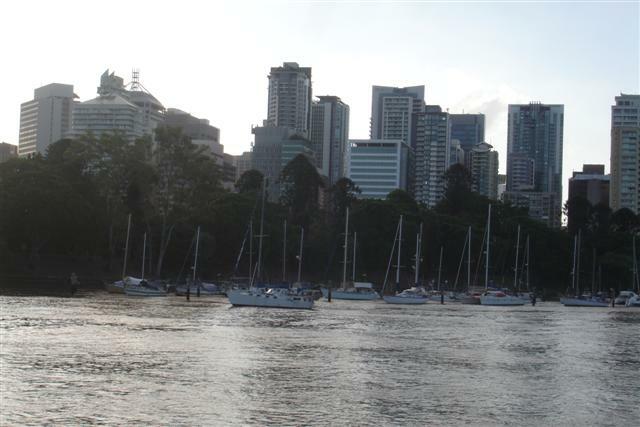 Enveloped by the Brisbane river the tall skyscrapers of the CBD sit neatly around some beautiful colonial buildings. Camomile was tied to the pile moorings by the Botanical gardens, which were very convenient and, apart from the wash of the occasional ferry, were very protected. The shopping precincts of the town were only a 10-minute walk away. 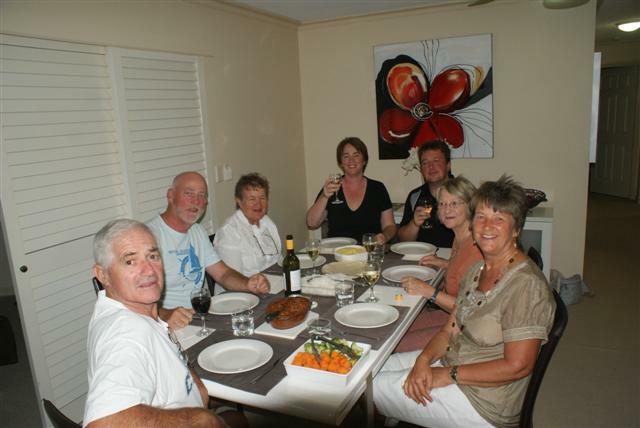 While in Brisbane we had special guests to supper. 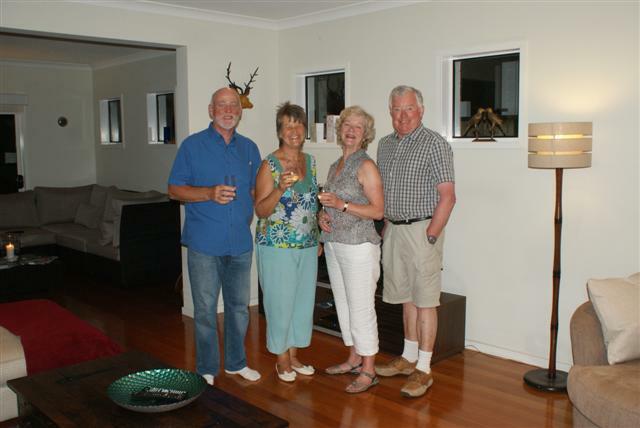 Judith Symonds commodore of the Westerly Owners Association and her husband David were visiting family in Brisbane and we had invited them to join us on Camomile. It was great to catch up. They in turn invited us to dinner at their daughter’s house. We took the ferry there giving us a chance to see the CBD lit up in all its finery. The sewing machine came out again. 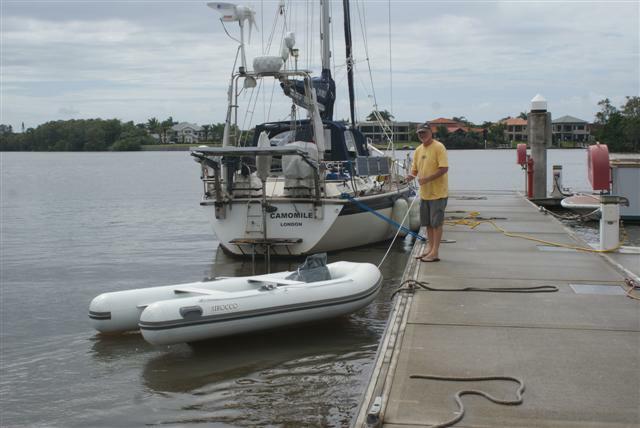 When we tied our lovely new dinghy to the dinghy dock on the river it looked very new and shiny and almost had a sign on it saying ‘steal me’. We still had the tonneau cover from the old dinghy, it was very tatty but I set about making a cover out of it to make Rocco look ‘grotty’. 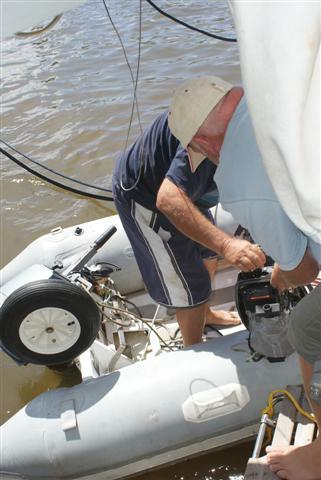 We used an old fender sock to cover the outboard, especially the 15hp label, which apparently makes it very desirable. 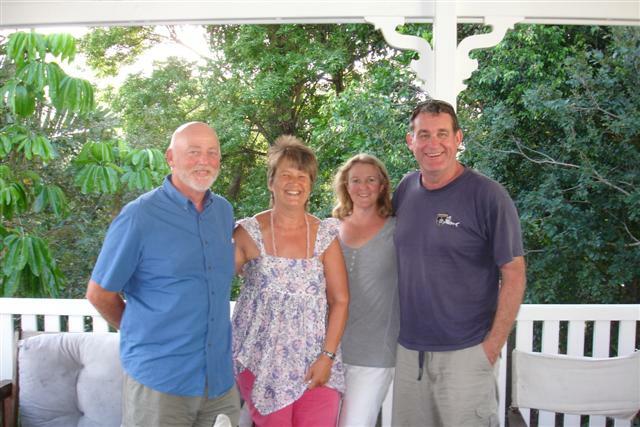 We enjoyed time with our friends Gary and Jackie off of the Canadian boat Inspiration Lady who had spent Christmas with us on Camomile in Sydney. Gary is a bigger collector of ‘rubbish’ commonly referred to as ‘spares’ than Bill is. 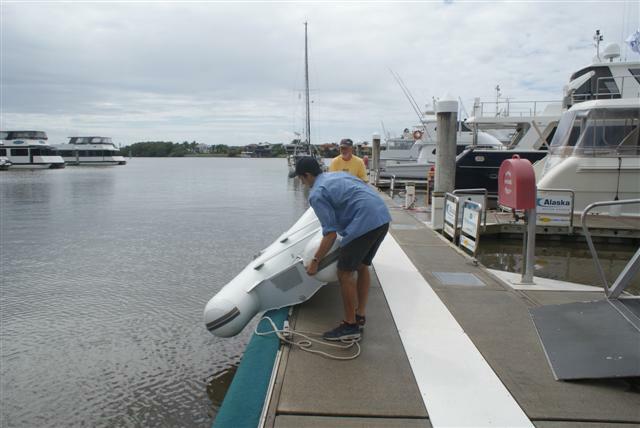 He spotted our old broken outboard still sitting on the outboard bracket on the stern. Bill hadn’t decided what to do with it. As it’s the same model as his he asked if he could have it for spares. It was useless to us and completely un-repairable so we gave it to him. Jackie will never forgive me! Our lovely Aussie friends Chris and Cate who live in Brisbane came to fetch us one morning and took us back to their house for a delicious lunch. Cate let me use her washing machine and we took the jerries along to fill with diesel on the way back home too. They had kindly taken in a parcel for us that my sister Amanda had sent with our new dinghy wheels and outboard bracket in. 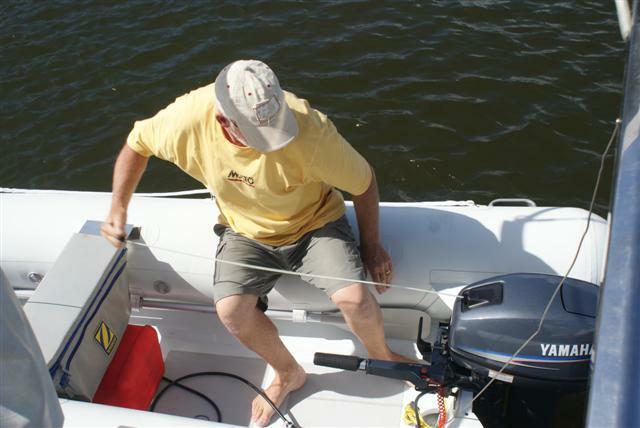 Once back at the boat Bill fitted the wheels to Rocco so the dinghy is as good as it was before but even faster being lighter and having a more powerful outboard. 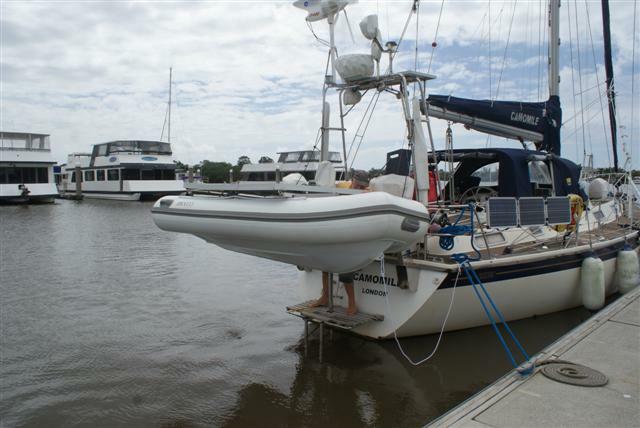 Friday 29th March after provisioning the boat, washed everything on the boat that could be washed, and topped up with water, we released our mooring lines and motored back down the Brisbane river to start the next part of our adventure beginning with the Easter weekend in Moreton bay. 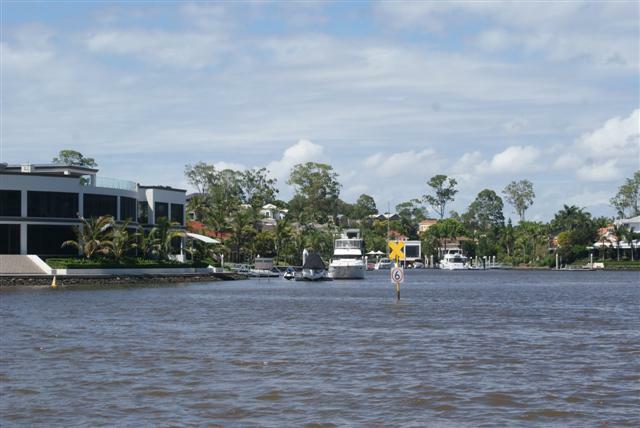 We made our way up the Brisbane river late on Wednesday 13th March ready for the arrival of the family the next day. The following evening we excitedly waited outside Kate’s hotel for her arrival. 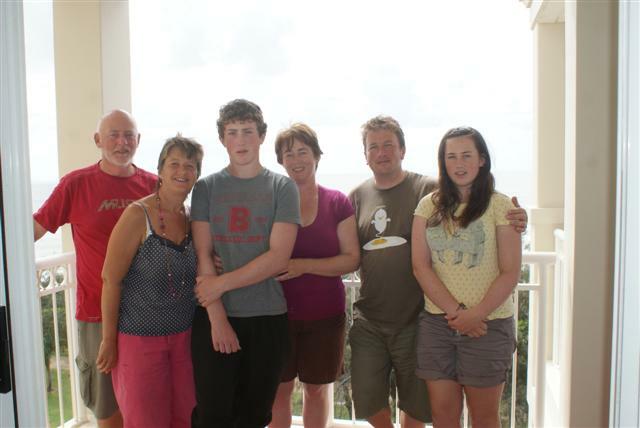 Bill’s sister was flying into Australia from NZ with her husband Barry and the teenagers, Will and Daisy. We hadn’t seen them for over a year and were really excited. It was late by the time they arrived dragging huge bags with them for their 10 day stay. We just had a drink with them then left them to settle in. The next morning I went for my little run-walk ending up at the hotel where we all enjoyed the hotel swimming pool, which fortunately we had to ourselves. 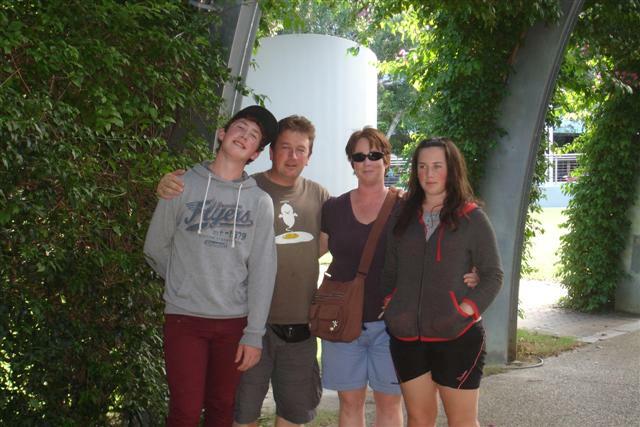 We all walked into the city for lunch and around the gardens on the Southbank. 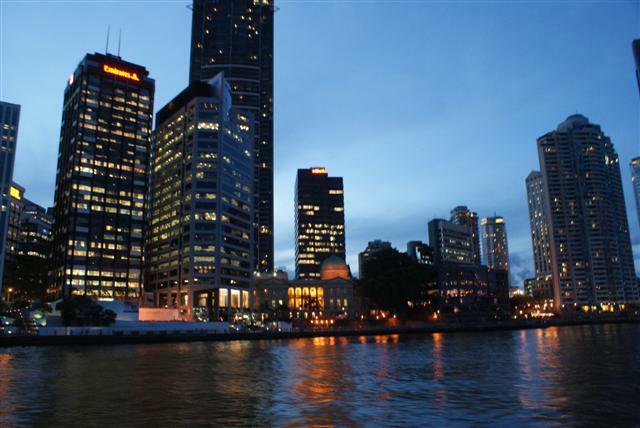 They enjoyed their second night in the hotel in Brisbane then checked out and joined us on Camomile for a cup of tea before exploring more of Brisbane. 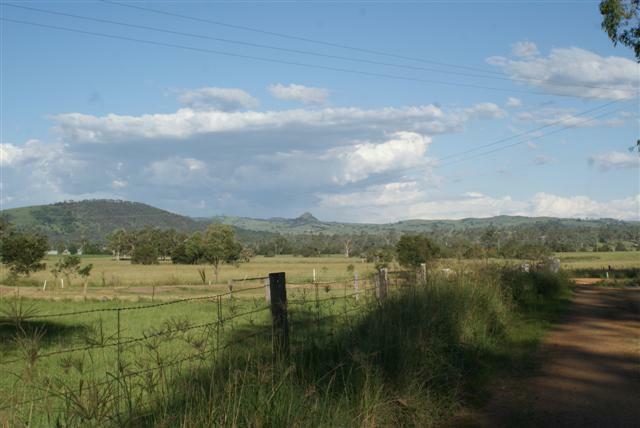 After spending their second day in the city they were picked up by cousin John and taken out to Boonah, a couple of hours outside Brisbane, for three days. On the Sunday we got up early and caught the train to Ipswich where John picked us up to spend the day altogether. John would have been Bill’s father’s cousin so he’s Bill’s cousin once removed … we think!! 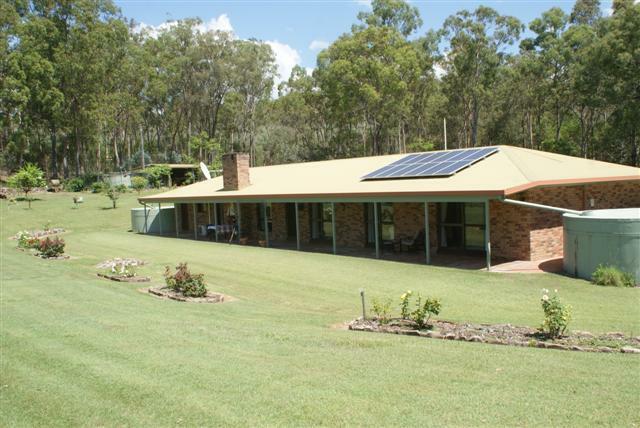 They have a lovely home high up in hills behind the city surrounded by about 20 acres of land, complete with their own lake. 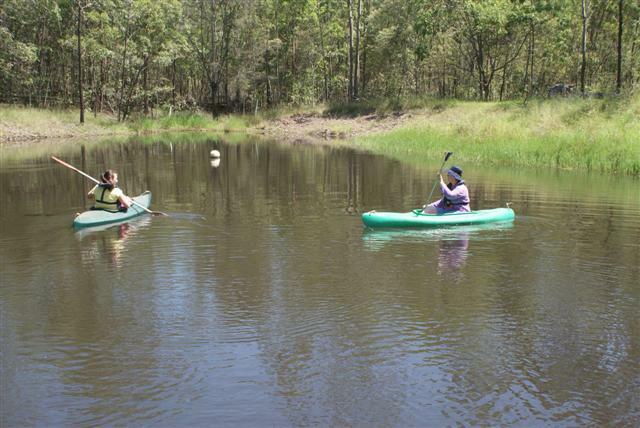 Kate and Daisy decided to have a paddle around in the canoes. 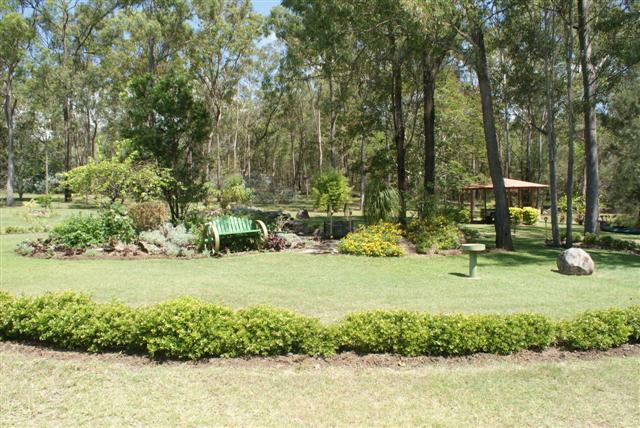 Helen has a beautiful garden which she spends long hours in. After lunch John took us for a walk around his land where we were fortunate enough to see a koala sitting high up in the trees trying hard to ignore us. 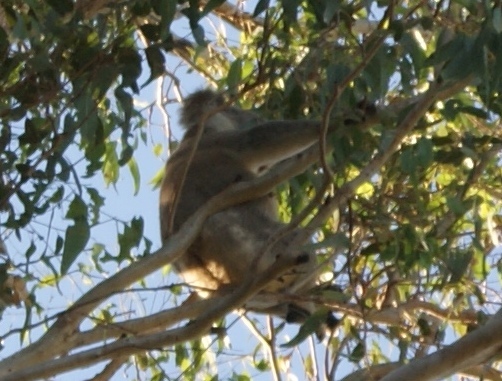 Our first wild koala in his own natural surroundings, we were really lucky. On the way back to the station John drove through an area where he knew there would be lots of kangaroos, so I enjoyed watching them too. 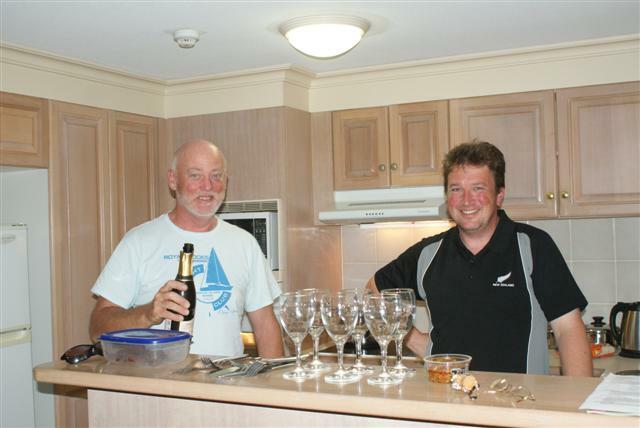 On the Tuesday the tribe decamped to their apartment on the Gold Coast where they were to spend the second half of their holiday. We packed a bag and joined them for two days. Also to arrive was Susan, John’s sister, who had brought along a selection of photos of the family, young and old, from her collection. We were able to show some of our collection too and we spent an evening puzzling out family connections. So for the benefit of the family at home we have from left to right cousin John (also Nan’s nephew), Bill, John’s wife Helen, Kate, Barry, John’s sister Susan and Sue. Barry cooked us a wonderful meal. Wednesday 20th Bill and I were dragged kicking and screaming to Wet’n’Wild!! Only joking we all choose the water park out of the 5 available. Cousin Susan decided to join us, brave lady. Fortunately it wasn’t very busy because the school holidays haven’t started yet but that also meant that some of the rides were closed. I enjoyed the ones that you sit on something to slide to the bottom but tried one of the flume rides that you slide down on your own back and managed to wrench my shoulder so decided against any more of those. Bill very bravely joined the kids on some of the ‘sudden drop’ rides – very brave. 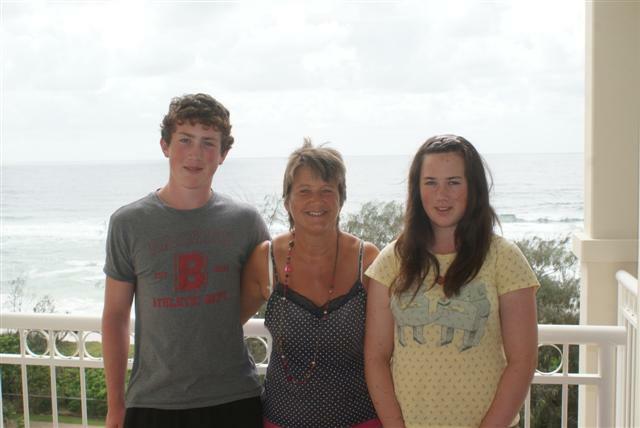 We all left on Thursday to allow Kate and Barry to enjoy the rest of their holiday with Will and Daisy. 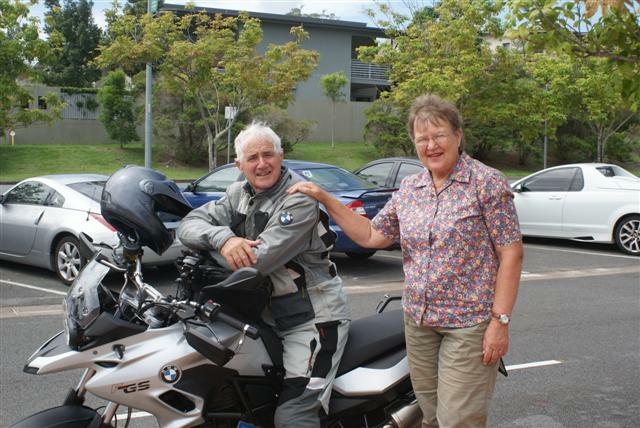 John had come down from Boonah on his BMW bike while Helen had driven down with the others in the car. So she was able to give us a lift back to the station to catch our train back to the city and Camomile. Thank you John and Helen and Susan for having us, we had a wonderful time meeting you. We were weather watching once again and, this time, I wanted something like perfect sailing conditions to restore our confidence on this first passage since our force 10 trashing. I was confident in Camomile as she is a tough old bird and all her hardware, with the exception of the dinghy and outboard had been brought back up to scratch. It was the human-ware which needed to get back in the saddle to repair the psychological dents and scratches. Looking over the harbour wall to see what the conditions were like – no, not going yet! Motoring at first with the single reefed main up for stability the southerly wind eventually struck up and after one false start we were able to twizzle the two genoas, finally starting to make some headway against the current which must have been running at more than two knots plus. 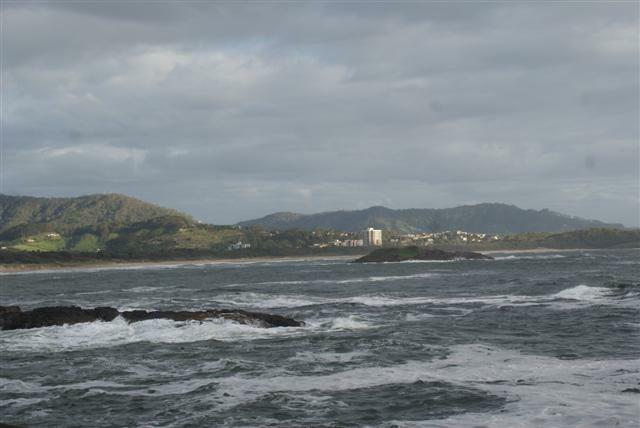 We passed Byron Bay, the most easterly cape in Australia, and pressed on back into Queensland. 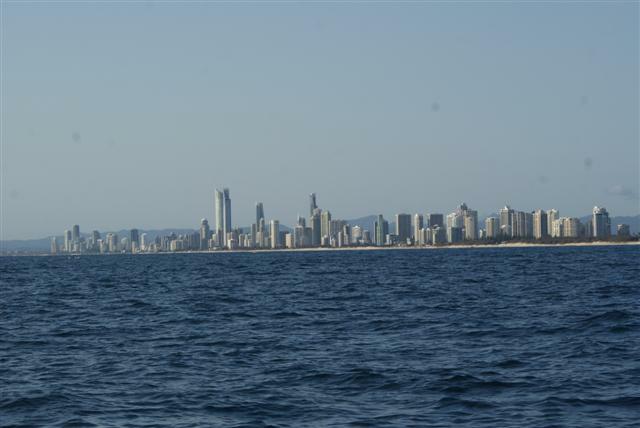 I was apprehensive on the approach to the Goldcoast Seaway as it is not far from a place called Surfers Paradise and, like most entrances hereabouts, is shallow. This might make it a paradise for surfers but it can also make it Yottie Hell in onshore conditions. All was well though and we dropped our hook in the quiet, shallow Broadwater protected from the sea by its massive sand bank. 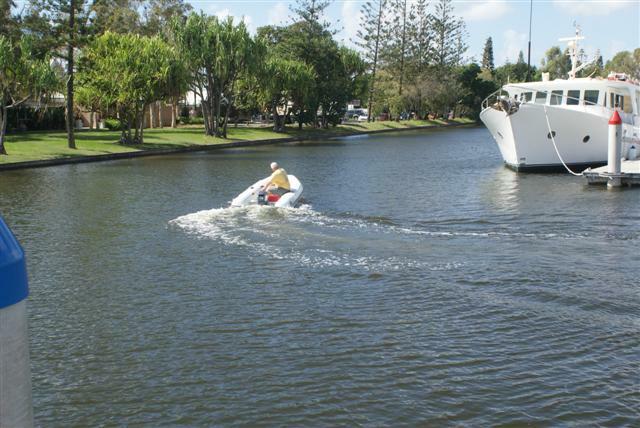 The following morning it was back to business and we headed up the Coomera River to the City Marina where several of the local dinghy suppliers were based. I was particularly interested in a Sirocco ex display model which was heavily discounted as it had some marks on it. Perfect! Arriving at the showroom though I was devastated to be told it had just been sold. We spent the rest of the morning looking around other suppliers but it was really starting to seem that the new tender was going to cost well above the insurance cover. 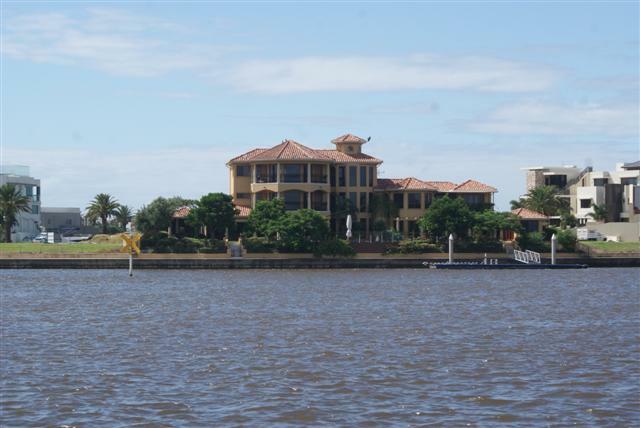 Returning down the river to the anchorage at Broadwater we admired the multimillion houses lining one side of the river which came in all possible styles and sizes with swimming pools, moorings at the bottom of the garden and, a little strangely we thought, meshing around the balconies which we assumed was to keep the sun from the fair skin of the Aussie elite who occupied these palaces. 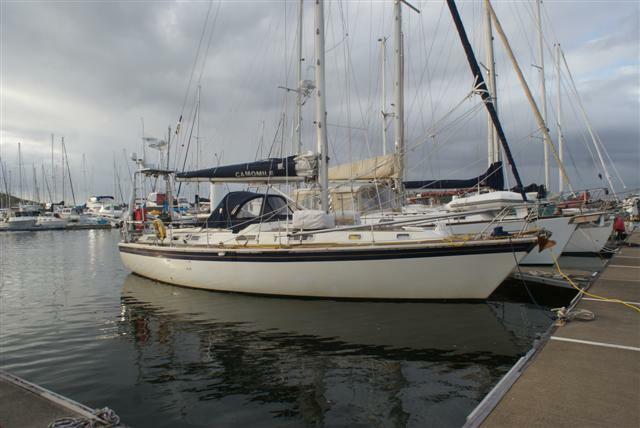 Sitting back at the anchorage on Saturday afternoon and back on the internet I was surprised to see the dinghy I liked had been re-listed and thinking this was a mistake phoned up to ask “is it sold or not?”. I was elated to hear that the sale of earlier that day had fallen through so arranged to meet at the shop the following morning. We hauled up the anchor straight away and hotfooted it back up the river arriving at the marina just before dark. As I was securing to a mooring buoy though I suddenly noticed that I was surrounded by a fine buzzing noise. 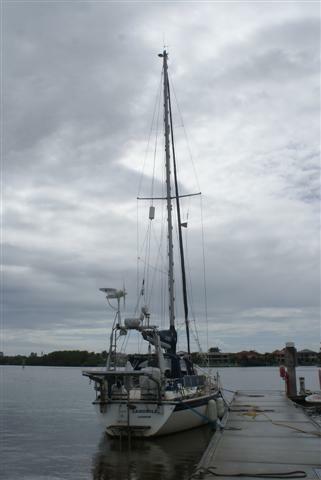 I looked straight up in case I was under a power line (not good when you have a mast) but there was no sign. I peered out into the gathering gloom and saw that I was surrounded by the biggest mosquitoes I have ever seen. 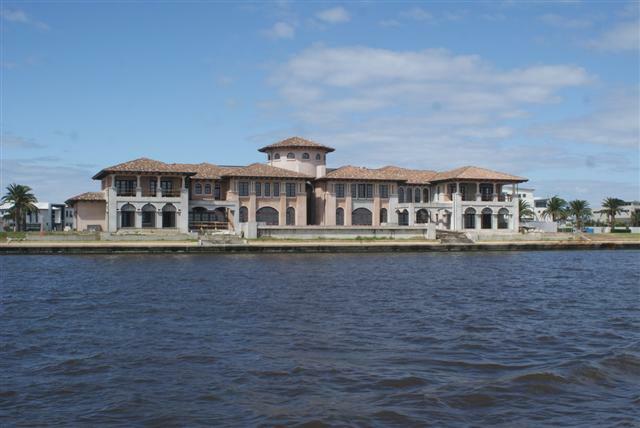 Suddenly the mesh around all the houses balconies made sense and we went into MosCon 5 locking down the boat and setting out on an extermination spree down below where some intruders had already penetrated. 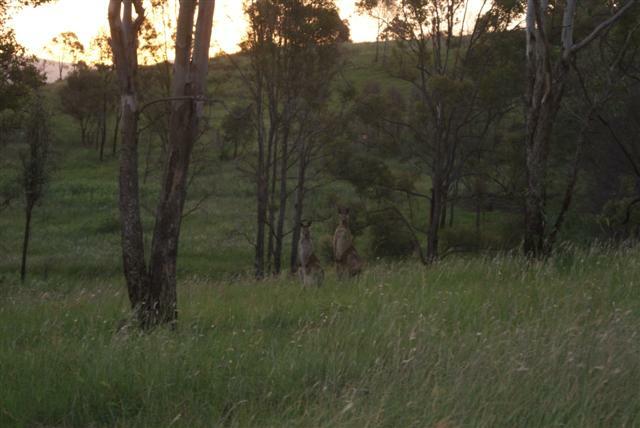 They were the size of sparrows, fair dinkum! The following morning we put Camomile alongside and went off to find her new tender. Shaun was quick and efficient so within an hour we were back with a shiny new inflatable which was duly introduced to Camomile and they were both told to “play nicely” Guess who? 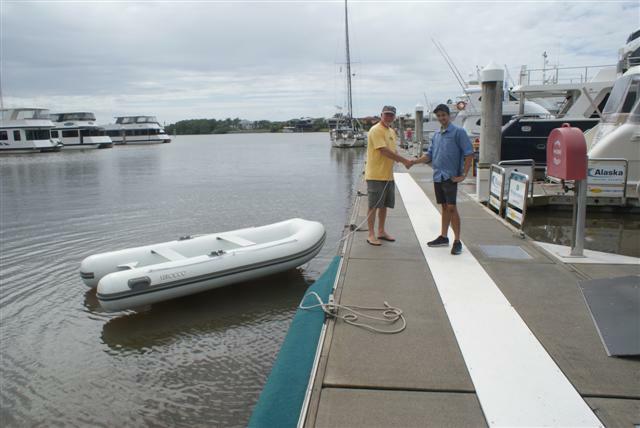 Bill with the new dinghy that’s going to be called Rocco and is a boy. And guess who had to have the first go in him too! 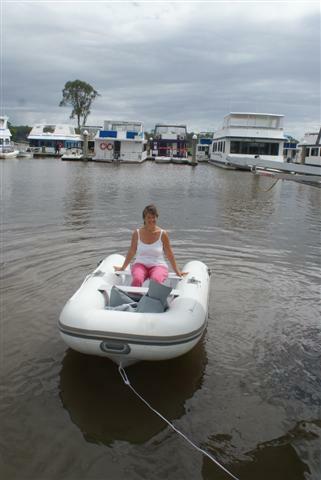 So with the dinghy davited, again we motored back down the river to the anchorage. 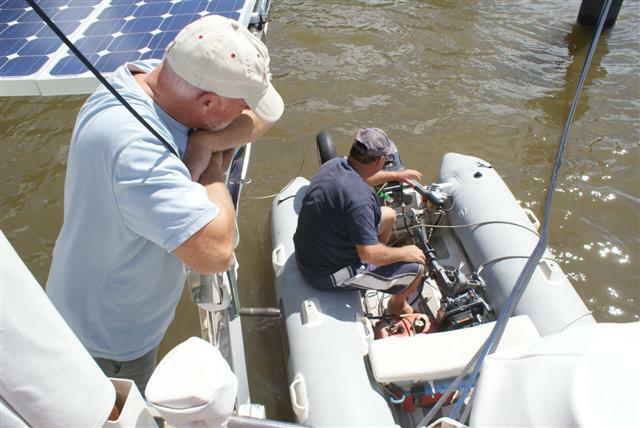 We could now get ashore and it was great to be mobile again as we rowed to the beach that evening. We walked across the sandy spit by the Broadwater to walk along the beach where the surf pounded the shallow approaches. 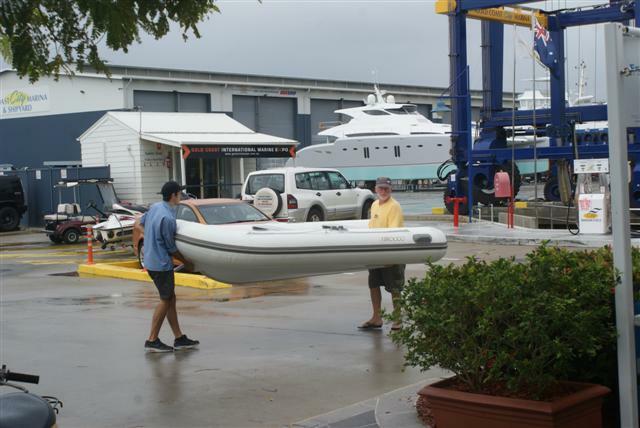 Rowing is all right but it is overrated when you need to travel a proper distance so it was anchor up the next day and into Runaway Bay marina where we could unload the bikes and cycle to the outboard suppliers. 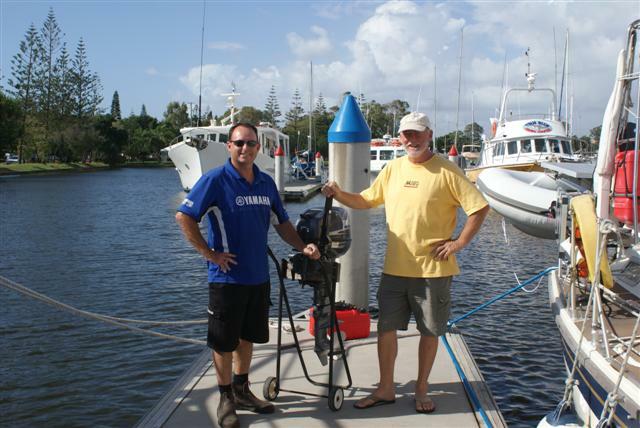 After cycling more miles around Labrador than our bottoms are used to and some thorough interrogation of the local suppliers we became the proud owners of another outboard motor which was duly delivered to Runaway Bay Marina the following morning. My turn to play wahoo! The boys are really going to enjoy having a go with this one too. Camomile was finally complete again so we were all set to make our way up to Brisbane where we were planning a family reunion with my sister Kate and family and our Aussie cousins.